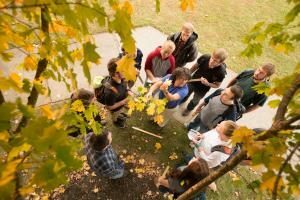 Thanks to a new grant from the Golden LEAF Foundation, Brevard College is moving forward with plans to become the only college in Western North Carolina to offer an agricultural education program. The $75,000 grant allowed the College to hire a new professor without affecting next year’s operational budget and will provide funds to purchase a greenhouse. Pending approval from the North Carolina Department of Public Instruction, the College plans to add teacher licensure in agricultural education to the existing major in environmental studies, and it will develop a minor in sustainable agriculture. “This grant fits our school really well, and allows us to build on existing strengths. This is who we are,” said Jennifer Frick-Ruppert, BC professor of biology and environmental science, chair of the science and mathematics division, and one of the grant collaborators. After a national search, Gina Raicovich was chosen as the new assistant professor of environmental studies and sustainable agriculture. Raicovich holds a Master of Science degree in environmental studies with a focus in sustainable agriculture from the University of Montana in Missoula, Montana. She formerly served as the university farm manager for Sewanee: The University of the South, in Sewanee, Tennessee, was the staffing coordinator for North Carolina Outward Bound School, and remains an operator of her own farm near Asheville. She will join the faculty this fall. “We are delighted that Raicovich will join our faculty and bring her experience to enhance our program in environmental studies and sustainable agriculture,” Frick-Ruppert said.The North Carolina Legislature created the Golden LEAF Foundation in 1999 to strengthen the economies of tobacco-dependent, economically distressed and rural communities. The Foundation awards funds to projects with the most potential for bolstering success in their priority areas, which include “programs related to agriculture, job creation and retention, and workforce preparedness,” according to the organization’s website. The new program will make Brevard the only college in the Western half of North Carolina to offer an agricultural education program. Brevard will be the fourth college to offer agricultural education in North Carolina, preceded only by North Carolina State University in Raleigh, North Carolina A&T State University in Greensboro, and The University of Mount Olive in Mount Olive. Brevard College is a four-year private, residential liberal arts college in the Blue Ridge Mountains of WNC. The College is distinct among liberal arts colleges because of its commitment to experiential education in a highly personalized learning environment. By remaining intentionally small, the College can offer students hands-on experiences and opportunities for focused reflection. The addition of an agricultural education program will allow students to engage with their surroundings and encourage purposeful contribution to the community and thoughtful stewardship of the environment. Listen here for an interview about our new program with Dr. Jennifer Frick-Ruppert that was featured on WNCW (88.7).